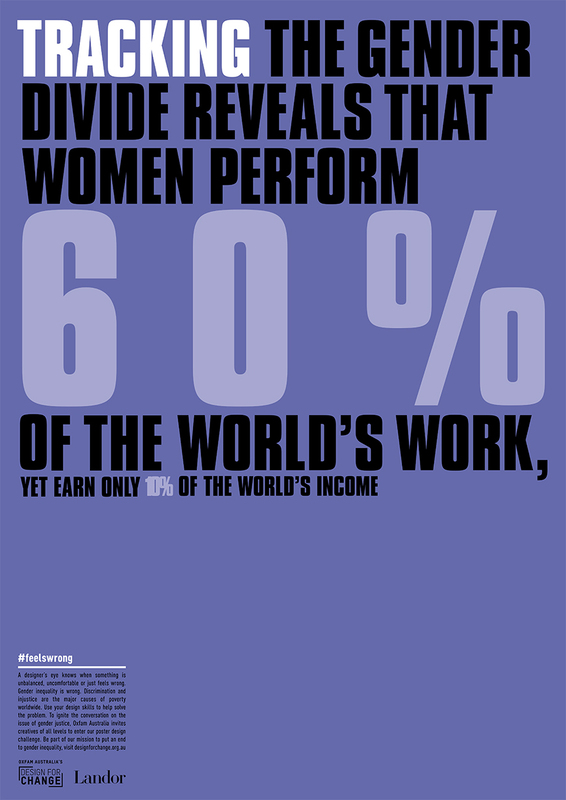 I doubt anyone could be anything but shocked by these appalling statistics, while I always knew wage equality (and lack thereof) between sexes was a serious issue it wasn't until I was approached by OXFAM and provided with these stats that I really appreciated the extent of this problem. A couple of weeks ago I flew to Sydney to speak on a panel discussing wage inequality and the role of design in society - a selection of speakers shared their perspectives followed by an audience Q&A and we launched OXFAM's latest initiative Design For Change. Design For Change is a campaign aimed at raising awareness of inequality through design and social media and understands that through communication and shared knowledge we can all take a stand against this worldwide issue. Looking back at history it is obvious that the design voice is a strong, and influential one - from propaganda posters and the "We Want You" posters of WWI and WWII, to the 2008 Obama campaign, a well designed poster catches your eye, sticks in your mind and has the power to affect your emotions and actions. Good design has the ability to generate response, it it legitimises thoughts and puts them in to action. OXFAM are calling on you and your design skills to help them raise awareness, and change the patterns of social inequality. Start the conversation using the hashtag #feelswrong, or even better why not get involved and create a poster of your own to share your thoughts on the issue. Until June 30th OXFAM are asking you to submit and share your poster designs through their site here , the best posters will be included in an OXFAM exhibition and one will be chosen for billboards in Sydney and Melbourne. Value what your creativity can do, share it, use your voice and change our world.